OK, move on, this is a fake… bleu screen with Adobe After effect applied. Looked good none the less. I downloaded the HD version of the video (1st one is 720P and 2nd 1080p) and studied them frame by frame and I must say that the second video appear to show the real deal. You can clearly see the depth of the home button as the tablet move, the shadow of the finger on the glass above the UI, etc, etc. This is quite possibly the actual iSlate (or wathever name it will have). The first video appear to be from a prototype with no home button… strange. The second video clearly show the home button. 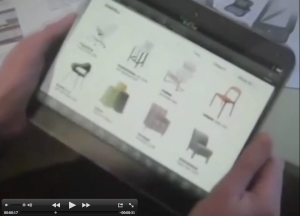 Some of the comments point to the UK IKEA app as being shown in the 1st vid… but in a form that is unknown on the iPhone (much larger screen). People also reported the presence of some old newton docs, papers, and various other apple docs on the desk of the presenter… possibly pointing to an apple developer as the source. I let you decide if this is real or fake. None the less those look really cool and if they are fake I tip my hat to the team that made them!